There are children here. I can smell them! "Come and get your lollipops. Ice cream, chocolate . . . all free today. Children where are you. I know you're here somewhere". Who could forget the evil Child Catcher from Chitty Chitty Bang Bang - truly the stuff of nightmares. 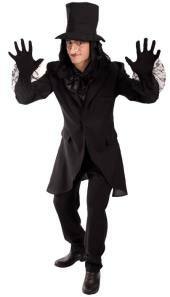 Now you can scare a brand new generation of kiddiewinkies in this fabulous Childcatcher Fancy Dress Costume. The outfit includes a long black jacket with lace around the cuffs, a pair of black trousers (with an elasticated waistband for comfort and a great fit) and a black top hat with attached black hair. The Adult Kid Catcher will make a brilliant choice for a creepy costume this Halloween. It is available in two sizes (standard /chest size to 42" and extra large / chest size to 46") and is on sale online for £39.49! The upturned, child finding nose isn't included but don't worry if your hooter isn't long enough as this professional looking Long Latex Nose is available separately for £9.99.